Everyone knows that the lure of home is strong for George, a Los Angeles kid who took countless jumpers as a youngster while pretending to be Kobe Bryant and wearing purple and gold. And players tend to go home: Paul Pierce played in LA toward the end of his career, Dwyane Wade briefly played in Chicago, Chauncey Billups had stints in Denver. So while diving into the magnitude of the numbers in George's soon-to-be-official deal with the Oklahoma City Thunder – four years at an average of $34 million a season, a contract that sure seems like it will help push the OKC payroll and luxury tax bills for next season alone to perhaps well over $200 million – there was one number that seems to have mattered most. He's still a young man, even by NBA standards. Consider this: George might not even be at his NBA peak yet. Barring an extension, which is possible, he could exercise his option to become a free agent again in the summer of 2021 – and even then he'll just be 31. Los Angeles will still be there, calling, winking, tugging at his heartstrings the way it clearly has for years. Another sure thing: That the Thunder, while not a Super Team per se, have super pieces. George shared the stage at a party in Oklahoma City on Saturday night with Russell Westbrook, which was fitting since they shared the basketball stage flawlessly in their first season together. All those questions – mostly variations of ``how will this work?'' – got answered when the Thunder went 40-22 in the final 62 games of the regular season, George got his numbers (nearly 22 points per game) and Westbrook got his again as well (averaging a triple-double). They speak with great respect for one another. They are not the same guy: Westbrook loves fashion and flash, George would rather go fishing. But it worked, on the court and off, and that bond is necessary if the Thunder are going to challenge Golden State and Houston for Western Conference supremacy anytime soon. It's not just those two. The Thunder have a good big man in Steven Adams. They're getting Andre Roberson back, probably in time to start next season after this past season ended prematurely because of a ruptured patellar tendon. They're keeping Jerami Grant for $27 million over three years, which in this NBA seems like a bargain. They have a good coach in Billy Donovan and by all accounts, it's a happy locker room. George kept dropping hints all spring. When asked about his future, he raved about how much he liked being in Oklahoma City. The more he said it, the more it seemed like he wasn't just spewing the company line. It seemed real, and now, the realness has been proven. The Thunder have some issues, mainly what to do with Carmelo Anthony. 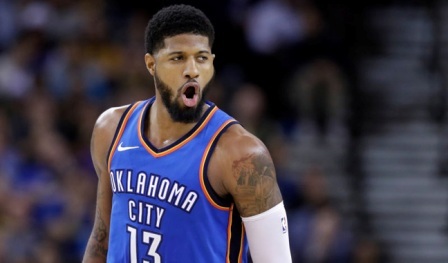 Anthony doesn't want to come off the bench, he's going to cost the Thunder something like $70 million – the luxury tax is going to be incredibly punitive – if they keep him, and his best days are behind him. Having a high-priced deal isn't Anthony's fault; blame it on the New York Knicks and Phil Jackson, the ones who orchestrated that contract. But it's now something that the Thunder will have to manage. That's as close as it gets to bad news in OKC right now. George could have left, gone to the Lakers to join LeBron James, and no one would have complained. It would have been the easiest thing. Staying in OKC was the power move, though, both for George and Thunder general manager Sam Presti. George took the stage at that party, grabbed a microphone and delivered four words that shocked many. ``I'm here to stay,'' he said. Stay is a relative word in the NBA. Nothing is forever, except the lure of home. LA will still be there in three or four years, if he wants to still play there. George was smart enough to see that. And the Thunder were smart enough to not let him get away.